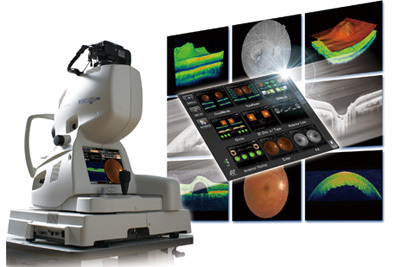 Preferred Eye Care, LLC is very excited to announce that each of our 3 offices now has the Topcon 3D OCT-2000. This instrumentation has two main features. First, with the Topcon 3D OCT-2000, our eye doctors now have the ability to take a comprehensive 16 mega-pixel picture of your retina, which is the multi-layered sensory tissue lining the back of the eye. The retinal picture is the best way to document eye conditions and diseases, as well as monitor changes inside the eye. Second, the device is equipped with an Optical Coherence Tomography, also known as an OCT. OCT is a non-invasive technology used for imaging the deeper retinal layers. This feature has revolutionized the early detection and treatment of eye conditions including macular holes, pre-retinal membranes, macular swelling, and even optic nerve damage in conditions such as glaucoma. Chances are you are familiar with ultra-sound or CT Scan. The OCT works similar to a CT scan of internal organs. The OCT works in a similar fashion to rapidly scan the eye and formulate a pixel representation of the anatomic layers within the retina. Our mission is to provide exceptional eye care with the latest in technology. With the addition of the Topcon 3D OCT-2000 our mission continues to be fulfilled!